Most species that have existed on planet Earth are extinct, including a number of early human species. Evolutionary biology and scientific evidence tell us that all humans evolved from apelike ancestors more than 6 million years ago in Africa. Information obtained from early-human fossils and archaeological remains suggests that there were 15 to 20 different species of early humans several million years ago. These species, called hominins, migrated into Asia around 2 million years ago, then into Europe and the rest of the world much later. 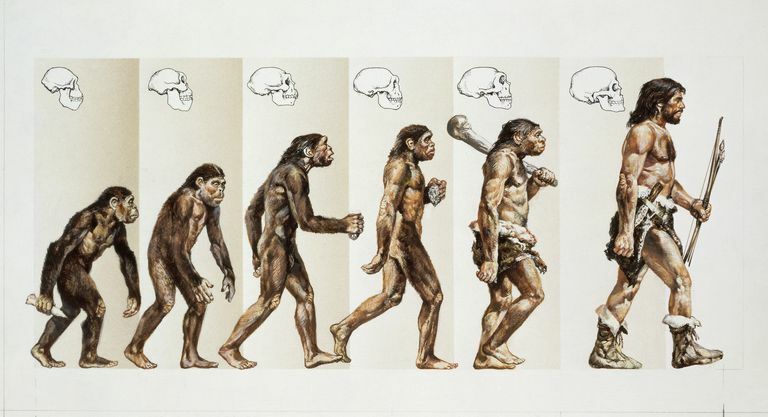 Although different branches of humans died out, the branch leading to the modern human, Homo sapiens, continued to evolve. Humans have much in common with other mammals on Earth in terms of physiology but are most like two other living primate species in terms of genetics and morphology: the chimpanzee and bonobo, with whom we spent the most time on the phylogenetic tree. However, as much like the chimpanzee and bonobo as we are, the differences are vast. Thomas Suddendorf, professor of psychology at the University of Queensland, Australia, and author of "The Gap: The Science of What Separates Us From Other Animals," says that "by establishing the presence and absence of mental traits in various animals, we can create a better understanding of the evolution of mind. The distribution of a trait across related species can shed light on when and on what branch or branches of the family tree the trait is most likely to have evolved." Although other primates also have opposable thumbs, meaning they can be moved around to touch the other fingers, imparting the ability to grasp, the human thumb differs from that of other primates in terms of exact location and size. According to the Center for Academic Research & Training in Anthropogeny, humans have "a relatively longer and more distally placed thumb" and "larger thumb muscles." The human hand has also evolved to be smaller and the fingers straighter. This has given us better fine motor skills and the ability to engage in detailed precision work such as writing with a pencil. Although there are other mammals that are hairless—the whale, elephant, and rhinoceros, to name a few—humans are the only primates to have mostly naked skin. Humans evolved that way because changes in the climate 200,000 years ago that demanded that they travel long distances for food and water. Humans also have an abundance of sweat glands, called eccrine glands. To make these glands more efficient, human bodies had to lose their hair to better dissipate heat. This enabled them to obtain the food they needed to nourish their bodies and brains, while keeping them at the right temperature and allowing them to grow. One of the most significant traits that make humans unique preceded and possibly led to the development of other notable characteristics: bipedalism—that is, using only two legs for walking. This trait emerged in humans millions of years ago, early in human evolutionary development and gave humans the advantage of being able to hold, carry, pick up, throw, touch, and see from a higher vantage point, with vision as the dominant sense. As human legs evolved to become longer about 1.6 million years ago and humans became more upright, they were able to travel great distances as well, expending relatively little energy in the process. In his book "The Expression of Emotions in Man and Animals," Charles Darwin said that "blushing is the most peculiar and the most human of all expressions." It is part of the "fight or flight response" of the sympathetic nervous system that causes the capillaries in human cheeks to dilate involuntarily in response to feeling embarrassment. No other mammal has this trait, and psychologists theorize that it has social benefits as well. Given that it is involuntary, blushing is considered to be an authentic expression of emotion. One of the things that forethought also gives humans is the awareness of mortality. Unitarian Universalist minister Forrest Church (1948-2009) explained his understanding of religion as "our human response to the dual reality of being alive and having to die. Knowing we are going to die not only places an acknowledged limit upon our lives, it also gives a special intensity and poignancy to the time we are given to live and love." Drawing on research in neuroscience, psychology, and evolutionary biology, in his book, "The Storytelling Animal," Jonathon Gottschall delves into what it means to be an animal that relies so uniquely on storytelling. He explains what makes stories so important: They help us to explore and simulate the future and test different outcomes without having to take real physical risks; they help to impart knowledge in a way that is personal and relatable to another person; and they encourage pro-social behavior, since "the urge to produce and consume moralistic stories is hard-wired into us." One factor that may account for human language acquisition and rapid cultural development is a gene mutation that only humans have on the FOXP2 gene, a gene we share with Neanderthals and chimpanzees, that is critical for the development of normal speech and language. A study by Dr. Ajit Varki of the University of California, San Diego, found another mutation unique to humans in the polysaccharide covering of the human cell surface. Dr. Varki found that the addition of just one oxygen molecule in the polysaccharide that covers the cell surface differentiates humans from all other animals.